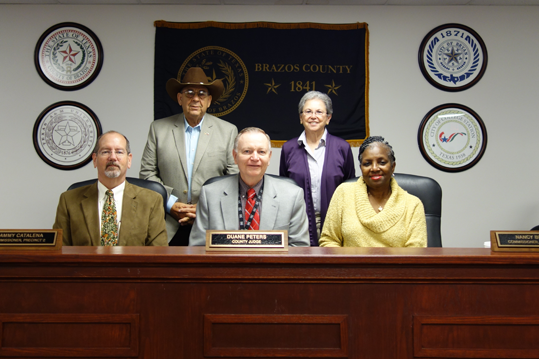 The Commissioners Court of Brazos County Texas is the governing body of the county. Despite its name "court,” the Commissioners Court does not act in a judiciary manner. The court is made up of a county judge and four county commissioners. The county judge is the presiding officer of the court. Each of the county commissioners is the representative for a fourth of the county. The county judge is elected by all of the residents of Brazos County, Texas and serves a four-year term. The county commissioners are elected by the residents within their single commissioner precinct and serve four-year terms as well, but their elections are staggered by two years. A major area of responsibility for Commissioners Court is overseeing the construction and maintenance of roads and bridges in Brazos County that are not part of the state highway system. The court also approves the hiring of, and the setting of salaries for, most county employees, and may appoint a replacement for a vacant elected position. The Commissioners Court has the power to create offices, boards, and commissions to fulfill certain needs. The court is authorized to issue bonds for the support of county projects and is responsible for the management of debt created by the sale of those bonds. The Commissioners Court may enter into contracts with other local governments, with the state, and with private entities. The court has financial responsibility for the county, including setting the tax rate, authorizing expenditures and issuing bonds. When and where are Commissioners Court meetings held? How do I get the Commissioners Court to review a particular subject?